Heat soup pot over medium heat. Add oil. When oil is hot, add onion. Add broth, tomatoes, black beans and pumpkin puree. Stir to combine ingredients and bring soup to a boil. cayenne and salt, to taste. Simmer 5 minutes, adjust seasonings and serve garnished with chives. Absolutely delicious! I had an ear of corn left over that I didn't know what to do with and figured it couldn't hurt anything so I added it. I don't think it hurt at all but, as this is the only time I have had this, I can't say for sure. I also served with a dallop of sour cream rather than the chives and I also believe that this was complimentary. I will undoubtedly make again and next time, I will add corn and serve with sour cream - it was that good. 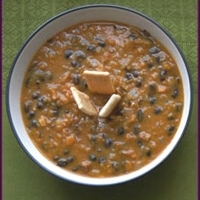 Love pumpkin soup, and the addition of the black beans is fabulous! Black been soup is one that I make often. The addition of pumpkin is genius. Sounds like another great way to use pumpkin. Saving for whenever we get cool weather here. High 5. This sounds really good! You can even lower the fat by using Swanson's 98% fat free chicken stock - I use it in everything that calls for stock. Sounds very good. I really like black beans. I love pumpkin. Put some black beans in chili once and it was really good too.